The Bosch EX26LED is a short to medium range infrared illuminator suitable for distances up to 18 m (59 ft). 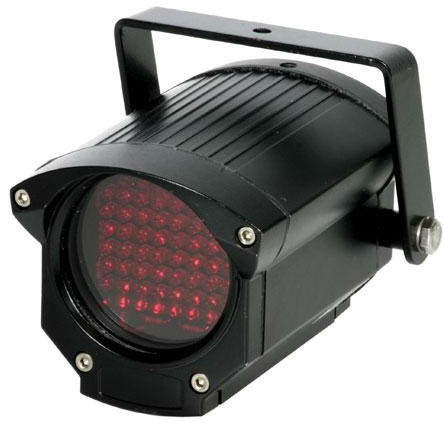 The EX26LED Infrared Illuminator is a versatile short to midrange illuminator [18 m (59 ft) with 850 nm LED�s, at a 30� beam angle]. It is encased in a weather-tight cast and extruded aluminum housing and is equipped with a U-bracket for instant installation. As a 12 VDC / 24 VAC unit, it is ideal for existing CCTV installations and new CCTV projects that specify 24 hour surveillance in and around buildings in covert or semi-covert conditions. The EX26LED is a compact, high-efficiency LED infrared illuminator that requires less than 15 W to achieve remarkable night time performance in outdoor or indoor locations. Designed for fast and easy installation, the EX26LED features photocell-sensitivity and LED intensity controls. [Find out more...] Bosch EX26LED "Technical Specifications". [Find out more...] Bosch EX26LED "Technical Data Sheet", 950 kB pdf file.